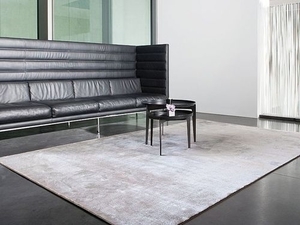 Contemporary rug," Inspiration" collection. Hand-knotted Nepalese wool and vegetable silk. ... considered as examples. Made-to-measure carpets are possible, on request. 400 x 270 cm. 50% wool and 50% silk. Base in wool and relief design in silk. ... considered as examples. Made-to-measure carpets are possible, on request. 400 x 300 cm. 80% wool and 20% silk. Base in wool, relief design in silk, silk border. ... considered as examples. Made-to-measure carpets are possible, on request. 400 x 300 cm. 50% wool and 50% silk. Base in wool, relief design in silk. The combination of natural silk, New Zealand wool and the finest mohair results in a soft surface with a wild color mix. A silk rug has a lustrous, luxurious appearance. Relatively delicate and expensive, it is not recommended for high-traffic areas. The silk is sometimes blended with wool or other materials to improve its resilience and stain resistance. On ArchiExpo, these rugs are arranged by properties such as type of silk, style or motif. Such rugs are found in low-traffic residential and commercial settings, as in a luxury hotel. They are sometimes used as a wall hanging. Consider how the appearance of the rug will affect its environment. Solid colors may be ideal for minimalist environments and can be used to draw attention to a particular area. Rugs with motifs add interest and show stains and wear less readily. If maintenance is an important factor, a blend may be preferable to a pure silk rug.